Grand Teton National Park is home to some of the most breathtaking alpine scenery in the United States. Owner and operator of Snake River Angler, Will Dornan, grew up on the Teton Valley Ranch in Jackson Hole and has spent his life on the region’s waters. With 40 years experience teaching fly fishing, fly tying, and river rafting, Will extends a warm welcome to all his guests. Snake River Angler opened it’s doors in 1997 when Will Dornan followed his passion and opened a small, one room fly shop, on his family’s property which predecessors homesteaded in the 1800’s in Moose, WY at the entrance of the yet to be formed Grand Teton National Park. The one room fly shop has since specialized in improving an angler’s knowledge and experience, while providing expert guiding services and outfitting. In the early 2000’s Will added scenic river trips to his operation, floating on the most picturesque and serene sections of the Snake River. Will expanded the Snake River Angler brand and opened a second shop in Jackson, WY. Snake River Angler provides unique fly patterns and custom rods, as well as all the gear one might need on the water, whether fishing or floating the Snake. In the winter, swing into the Jackson shop to take a rod building class or a fly tying class. We can’t wait to see you and take you on a once in a lifetime adventure on the area’s waters! The valley’s beautiful scenery and abundant wildlife played a vitally important role in the history of Jackson Hole. The Native Americans came to this area to hunt bison and other large game, and the first European and American visitors came to collect beaver pelts. John Colter, one of the members of the Lewis and Clark Expedition, headed to the mountain range in search of the much sought after furs. Soon, other trappers followed Colter’s example, and Jackson Hole became one of the prime areas of interest for famous mountain men and fur trappers. In the late 1800’s, cattle ranching became the major focus of the area, making it a larger and more permanent settlement and eventually creating the town of Jackson in 1894. Surrounding Jackson Hole are two of the most iconic National Parks: Grand Teton National Park and Yellowstone National Park. As the fame of Jackson Hole grew, more visitors found their way to the mountain valley. Today, the town is rich with local history and works vigorously to preserve the feeling of the Great American West. Grand Teton National Park is home to some of the most breathtaking alpine scenery in the United States and is a major piece to the history of Jackson Hole. In the 19th century tourists flocked to the area to experience the Old West and marvel the beauty of the Tetons. Tourists began to raise concerns about preserving the national beauty of the region and asked Congress to protect the area like they had done with Yellowstone National Park. 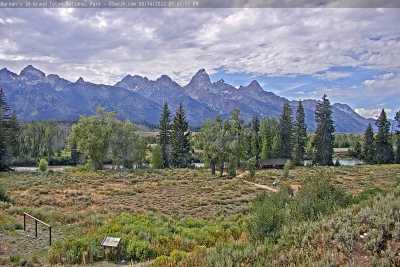 On February 26, 1929 Grand Teton National Park was created and dedicated. The park at that time included the mountains of the Teton Range and a strip of land that contained the major lakes at the base of the peaks. Shortly after the creation of the National Park, John D. Rockefeller began to buy land in the Jackson Hole area in order to donate it to the park in an effort to preserve the natural wonders of the region. In 1949, Rockefeller donated his land holding to the federal government which was then incorporated into Grand Teton National Park. Today, the park totals 485 square miles and is home to some of the most beautiful vistas and wildlife in the world.